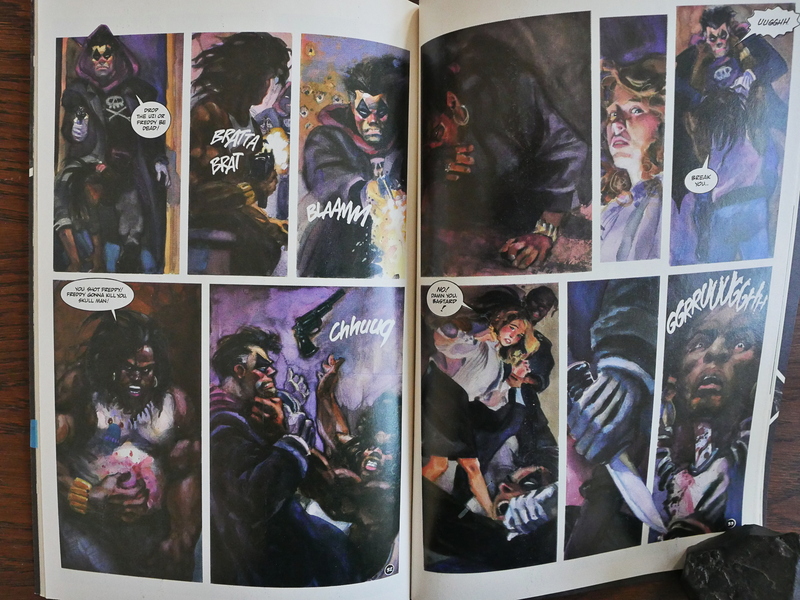 The Black Terror (1989) #1-3 by Beau Smith, Charles Dixon and Daniel Brereton. 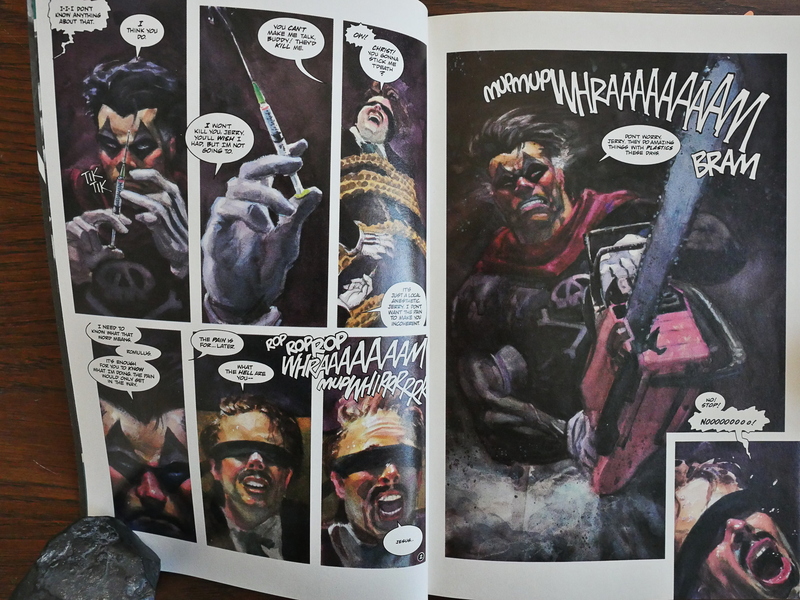 When the “prestige” format (48 page, squarebound) was introduced in the mid-80s, it was used to signify projects that were particularly ambitious: As a way to signal to the comics-buying audience “this is a special project”. So, of course, everybody else started pumping out their normal run-of-the-mill material in that format. Now he’s dark and broody and hyper-violent. Perhaps he was that way before? I have no idea. 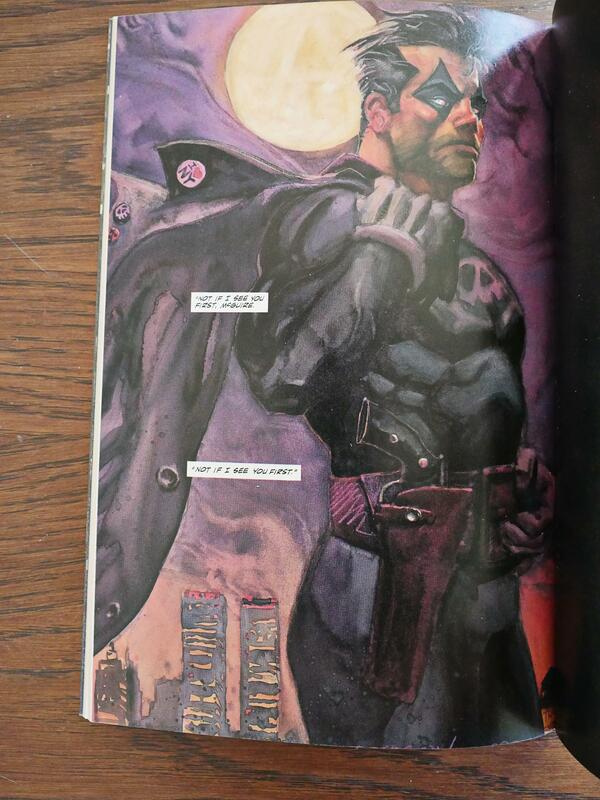 The artwork by Brereton is impressive, I guess.. He’s good at placing light sources and adding little yellow splashes (like blond(e) hair) to his dark browns and blues and purples. He’s not really that good at storytelling: At letting us in on where the characters are located next to each other, or even who the characters involved in a scene are. 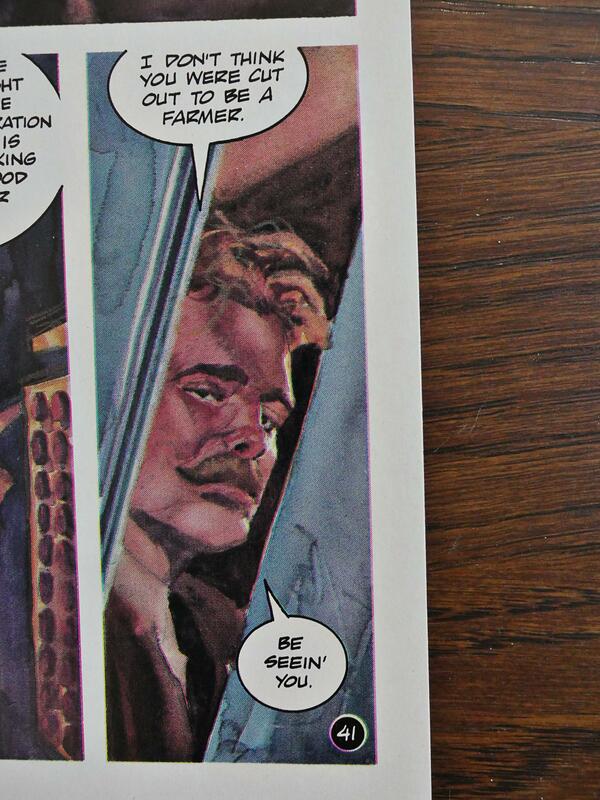 Instead it’s just *shift* *shift* *shift* between panels, and at the end somebody’s in a pool of blood. The plot… I’ve read worse things. It’s an alternate history thing where the Capone family is still huge, and there’s intrigue between a secret police organisation, the FBI and the mob. But it’s rather difficult to care, because it’s all so… silly. Yes, that’s a CD ROM that, when you read the data, erases your computer. That dude should definitely switch auto-run off! But who am I to counsel computer forensic experts. While the Black Terror kills quite a few people over the few pages, he doesn’t actually torture anybody, so I guess it’s a bit behind the curve on “gritty” comics characters. Above he only scares the villain into thinking he’s going to use the saw on him. 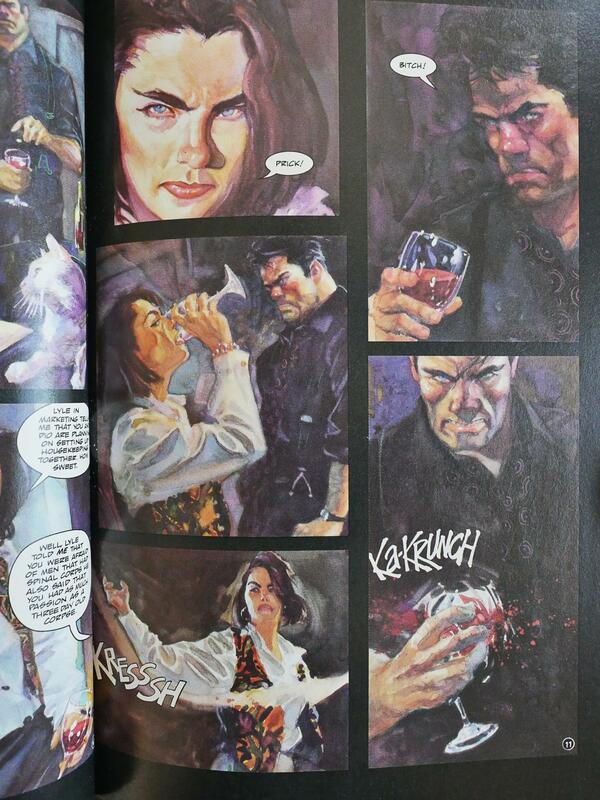 One little note about the storytelling: Brereton (or whoever did they layouts) uses this kind of half page all the time. The eye really wants to go from the top left panel to the top right panel, but that’s the wrong order. This subsection of the book is meant to be read vertically, left to right. It’s kinda odd, especially since there’s nothing about the placements of the speech balloons that direct they eye, either. The authors are apparently really tough, hard guys. And again, I can’t tell whether this is meant to be funny or not. So I guess if it’s supposed to be funny, it fails, and if it’s not, it’s pretty embarrassing? 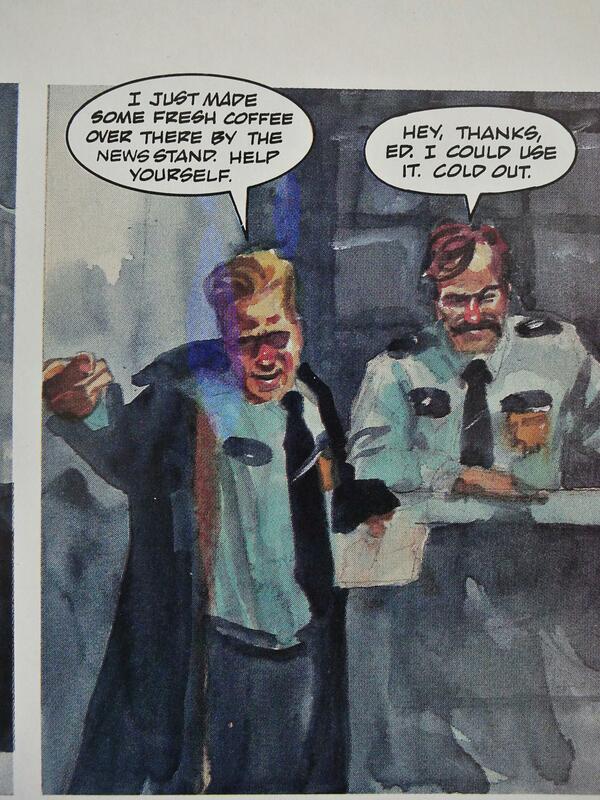 For a few panels in the third issue Brereton goes slightly more abstract and gives everybody clown noses. I can’t not show you the ending, but SPOILER ALERT! It’s the repetition that sells it! I mean, that made me start laughing, so if it’s a parody, there’s one successful page. 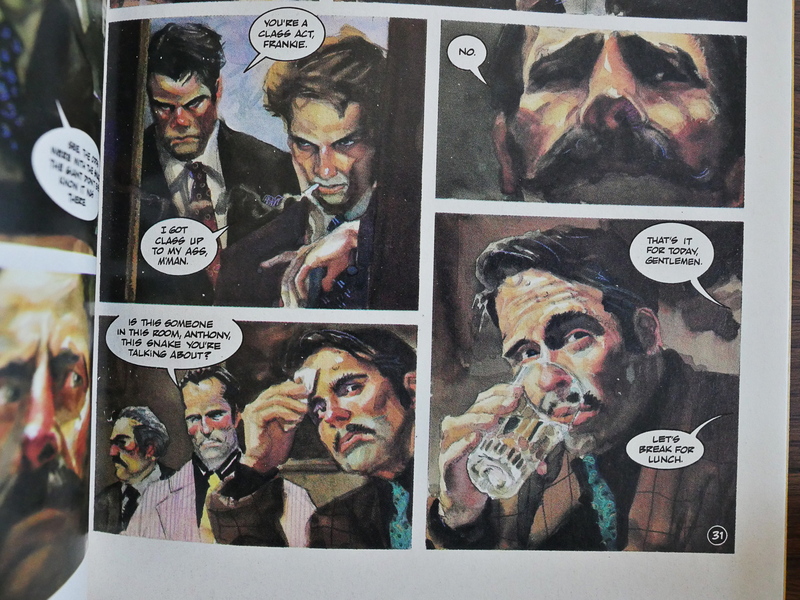 If you are a fan of Brereton’s artwork, or a fan of crime comics with a ‘retro’, Noir-ish aesthetic, then ‘The Black Terror’ is worth getting. 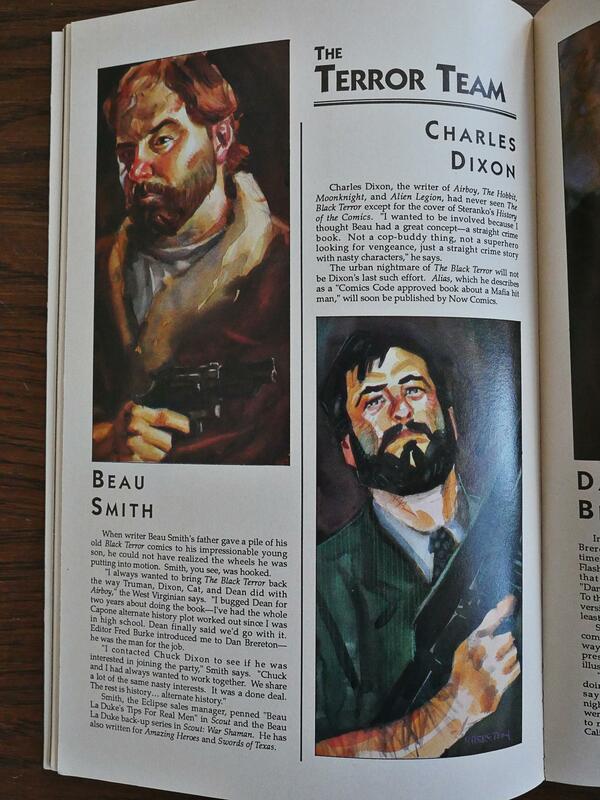 The three issues series did pretty good for a book that carried a $4.95 cover price. Each issue sold an average of 55,000 copies to the direct market. The part that thrilled us the most was that The Black Terror story was well received by the readers. Critical acclaim for the book traveled well through word of mouth and the icing on top of this piece of cake was that Dan won the Russ Manning Award for his work on the book. We were all really happy for Dan. Needless to say, his career in comics continued to rise after The Black Terror. 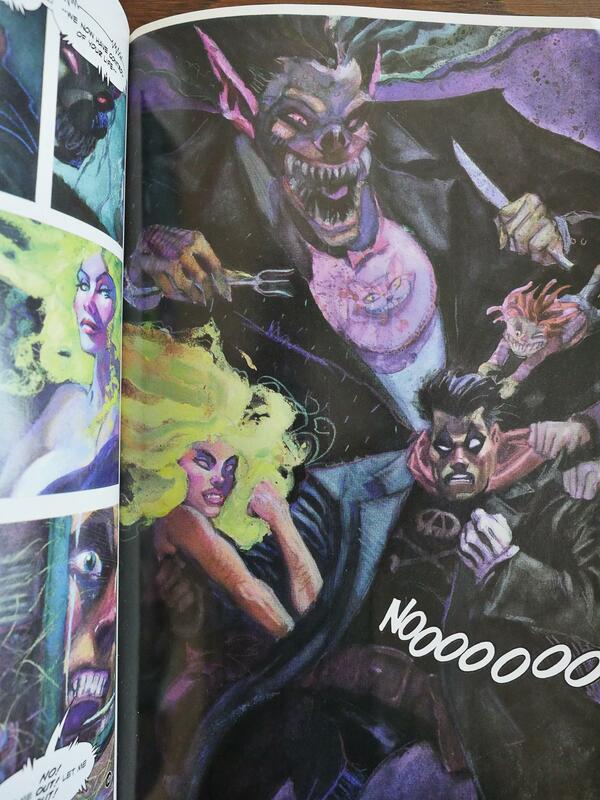 Dan has gone on to do high profile work for other publishers as well as his own creator-owned work such as The Nocturnals. Perhaps it wasn’t needless to say? But 55K copies is a very respectable number. I only have frustrations in that the series has never been collected. 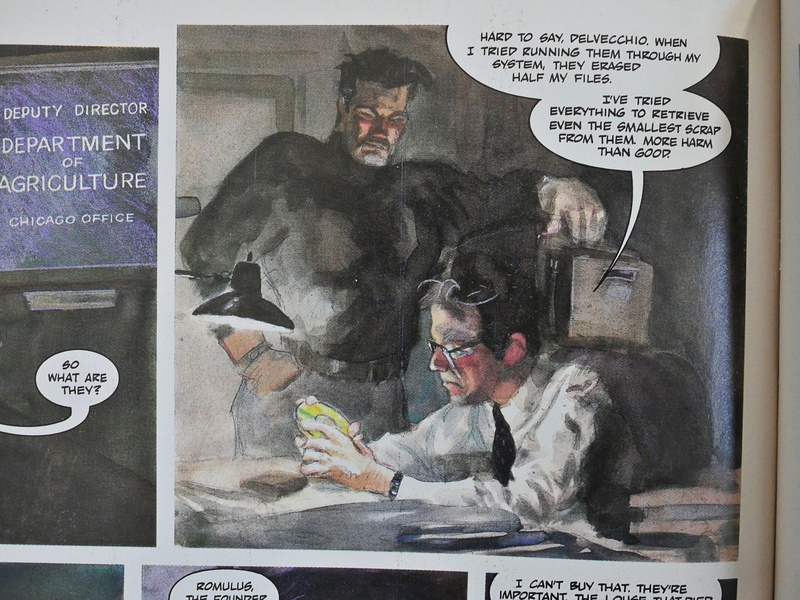 Without any conceit I feel that The Black Terror: Seduction Of Deceit not only stands the test of time, but I honestly believe that it is in the same league of The Dark Knight and The Watchmen. I know that’s pretty big talk, but I really do believe it. 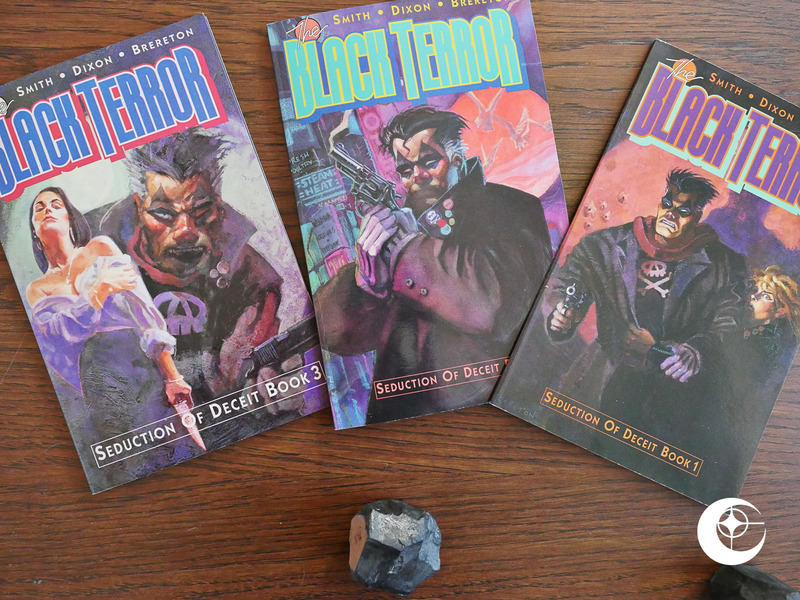 The Black Terror was a break-through series for superhero crime noir. If you read it, I think you’ll agree. Well, anyway, it still hasn’t been collected, for reasons I think are pretty self-evident, but you can pick up copies at cover price on Amazon, just 25 years later.